Israeli performers, Yaffa Yarkoni (left) and Ron Eliran, perfor-ming on stage at the Palais (Palace) de Shallot in Paris, France, in 1958 during the 10th anniversary celebrations in honor of the State of Israel. In 1948, the classical Israeli culture of songs, music, and lyrics was born. Russian music was popular, but the idea of Hebrew revival influenced this culture through the music and the tempo There were songs based on the bible, songs of the land of Canaan, songs of shepherds ('roim' in Hebrew). The idea was to express the Zionist world. The culture of songs had been "black and white" or dogmatic. I think that since the 1930�s, this culture has been revolutionized. Israeli poets influenced the songs: Expressing personal, intimate feelings. No more dogma but more individualism. The concept has been inward. We cannot ignore the great influence of the world's music, especially rock, pop, the Beatles and the Rolling Stones, for example. Today, we are facing a sort of a new revolution in our musical culture and lyrics: A wave of 'Mizrah' (Middle Eastern music), the second or third generation. It is non-Ashkenazi but rather has been influenced by Arabic music, the rhythm of the 'Mizrah's dancing. As to the style, you can see the influence of San Remo (Italy). I cannot guess about the future of Israel's music culture, but there is still a devotion to preserve the old classical songs, the songs of beautiful Israel. The nostalgia is still, perhaps forever, in our hearts," remarked, analytically, one of Israel's famous and great unique singers, Ron Eliran. Ron Eliran is a superb performer, especially in Israel and the USA, on stage, in concerts, and at many festivals. He is, also, a songwriter and composer. Eliran has many hits. He influenced the Israeli culture of songs. 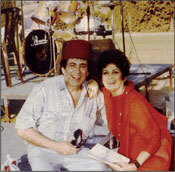 He contributed many popular Israeli songs with a female singer, Hendel, or the famous duo, Ron and Nama. He was friendly with singers such as Bob Dylan and others. He loves pop and rock music and the 1960's. He introduced the Ladino song. He did not forget Zionism: In 1998 he wrote If You Will, to celebrate Herzl and the first Zionist congress held in 1897, and he performed it in Bazel at the same stage on which Benjamin Theodore Herzl stood. By the way, Eliran performed his special song in Tel-Aviv's memorial to Rabin (lyrics by Gad Jaacoby). Performers Ron Eliran (left) and Yaffa Yarkoni, at the traditional Folkdance Festival in Carmiel in the Galilee in Israel. It is not surprising that last month 350 admirers and friends came to express their love to Eliran and his great national contributions to Israel's songs and music: Fifty Years of Eliran's Contributions to Israel's Songs. Fifty years of folk songs and rock and pop. 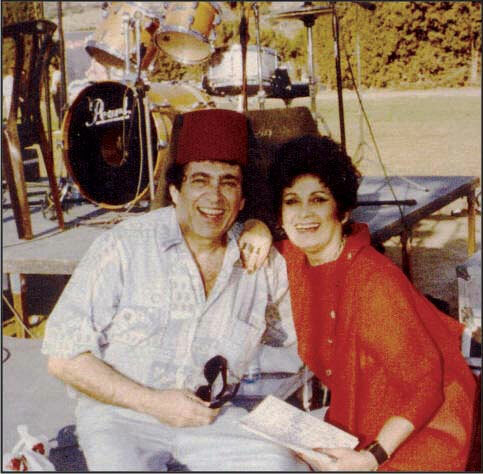 We must remember Ron Eliran's legendary song, 1967's Sharm El Sheich, (today Egypt's Mubarak resides there awaiting his trial). This song has been so popular that Eliran has been defined as Mister "Six Day War." Eliran has been influenced, since his childhood, and maintained a deep admiration and close friendship with, the legendary national singer, Yaffa Yarkoni who, recently, died in Israel. Eliran attended her funeral in Tel-Aviv. It was a national funeral. Israel loved Yarkoni, loved her unique voice, dedication to Israel's survival since 1948. Yaffa Yarkoni was a national symbol. Since 1948, as a 19 year old, she expressed, in her singing, whether classical music or tango, the history of the new state and especially it non-stop wars. She loved the army and she loved the soldiers. She gave her heart, love, and humor to Israel's success. Therefore, she gained the title Zameret Hamilchamot ('The singer of the wars' in English). For example, Bab el-Wad, which describes the War of 1948, the road to save Jerusalem. Yarkoni was only 19 years old when her young husband Yoskeh Gustin, a soldier with the Jewish Brigade which fought with the British against the Nazis in WWII, was killed in 1945. Yaffa sang Uri to express her love to Gustin. It was written by Rafael Klatchkin, the famous Israeli actor, with music by Issachar Miron, a well-known composer (Tzena). Why did Eliran and all of Israel fall in love with Yaffa? Eliran explained to us her unique secrets of performing. "First, her ability to build an immediate contact with her listeners! Second, she was the first one to sing quietly, whispering in your ears. Suddenly, her voice was a new style� musical news. Third, her personal warmth, her intimacy, her humor, was unique. Fourth, for her dedication to the IDF. It was a national fame, she was the singer of the wars. To perform, she even risked her life to sing at the dangerous military fronts. She became a symbol of heroism and a symbol of Israel's fight for survival. She was proud as a popular singer of the soldiers. She was brave. I'll never forget her," Eliran said. He also said that she surprised him with her tangos. He admired her and she was also sort of his teacher. 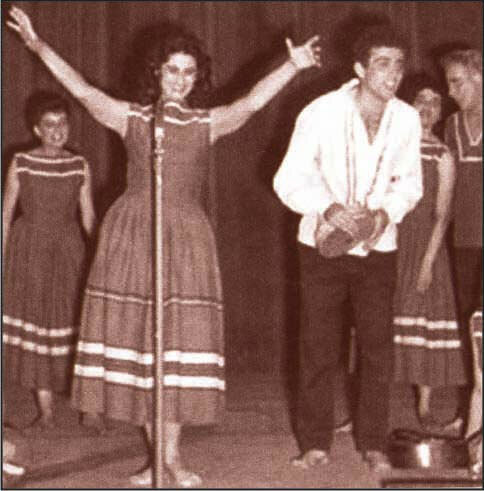 Eliran was honored by singing with Yarkoni many times, in many countries, especially as a young popular singer.